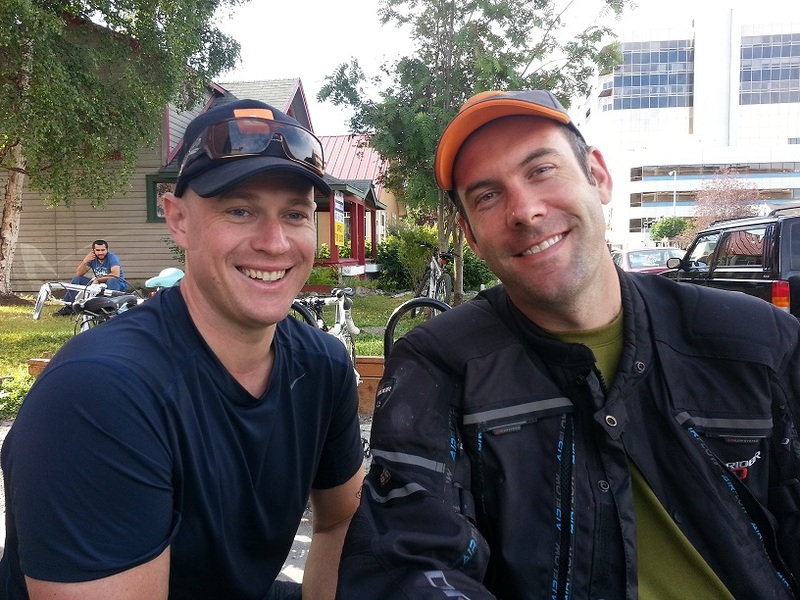 Ben and Adrian having brekky in Anchorage – their last meal after a couple of weeks together! After packing up the bike – our first ‘full’ pack of the bike on the trip – we headed into Anchorage’s downtown area to meet Ben for brekky. Fresh fruit, muesli, yoghurt, an espresso machine and soymilk from a café that is jam packed with people?! Yes please!! Another food tick for Anchorage. We only just – and I mean just – managed to squeeze everything in / on the bike. This was the moment that Adrian discovered the few extras I’d brought along…. ie things that aren’t on the packing list – such as a travel yoga mat, a skipping rope and a summer dress. He did an excellent job fitting everything into the panniers – a job interrupted only by a discussion on whether 2.5 months’ worth of cotton tampons were or were not a “luxury item” (direct quote!!!!) and therefore could be left behind and just purchased on an ‘as needs’ basis. Hrumph. My personal view is that a gopro (sports camera that you can mount to your handlebars or helmet) plus all necessary gopro accessories like a waterproof casing is a luxury item; tampons are not. Needless to say, both are in the panniers ;). 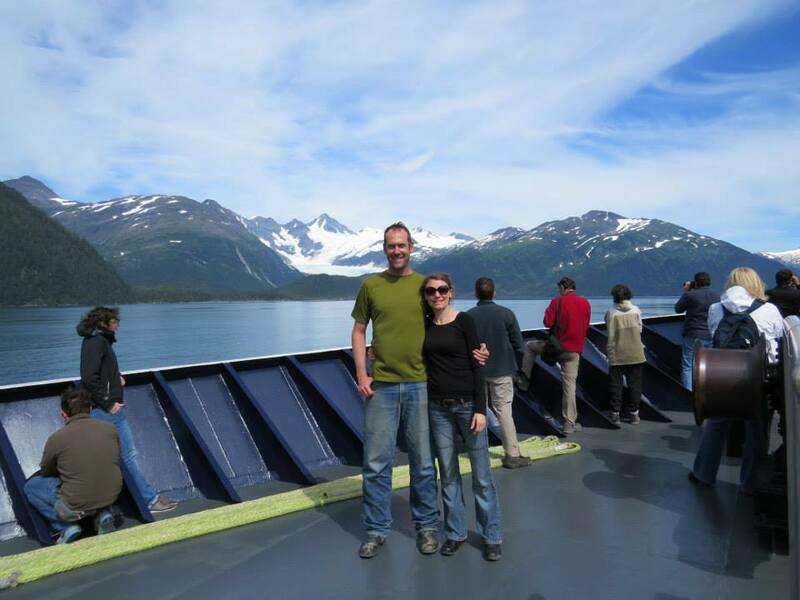 The ferry ride was just beautiful… calm, translucent, blue-green water surrounded by pine forests and mountains and glaciers. The light here seems to bounce of the water and burst into thousands of dancing, shimmering sparkles. Stunning. We caught up with a couple of other bikers (oh yes – it’s approaching 24 hours so I’m definitely biker now ;)) – one from Guatemala and one who spends his time between Mexico and the US. Both have invited us to stay with them when we’re passing through. It’s strange how that all works, this biker thing… and is kind of what I imagine being a stone mason must be like. You know, you’re sitting in a café and scratch your right ear three times and then cough twice before slapping your left thigh.. then you see a guy in the far corner do the same thing, your eyes meet and you realise you’re kindred spirits, BFF, that sort of thing. Being on or with the bike is similar to that. It’s like a universal icebreaker.. bikers and nonbikers alike jump right into conversation with you, there’s no awkwardness, it’s like you’ve known each other for a while. It’s an interesting social phenomenon – and one I’m embracing. Tonight we’ll be camping in Valdez at “Bear Paw” camping park. They have signs up saying that there’s a bear that has been hanging around, on and off, so don’t put rubbish out after 4pm or leave food in your tent. Still, I feel very safe here… with so many other camping Americans around, surely there are guns, too. So if the bear did come back, I figure all I’d have to do is call out. Strange really, that I feel safe because of the guns?! Guns, and all of my new friends. I arrived in Anchorage about 5.30pm local time after a 26 or so hour commute from Sydney. Happily, I managed to sleep for about half of that time… or at least I think I did… given that I missed one meal and was woken by my neighbours for two others before promptly going back to sleep. Nice to see that my special talent of being able to fall asleep before a plane has taken off is still going strong!! The flight into Anchorage was just stunning. We flew low over spectacular, snow topped mountain ranges and glaciers. With streaming sunshine and a clear blue sky as the backdrop, it was an incredible welcome to country. 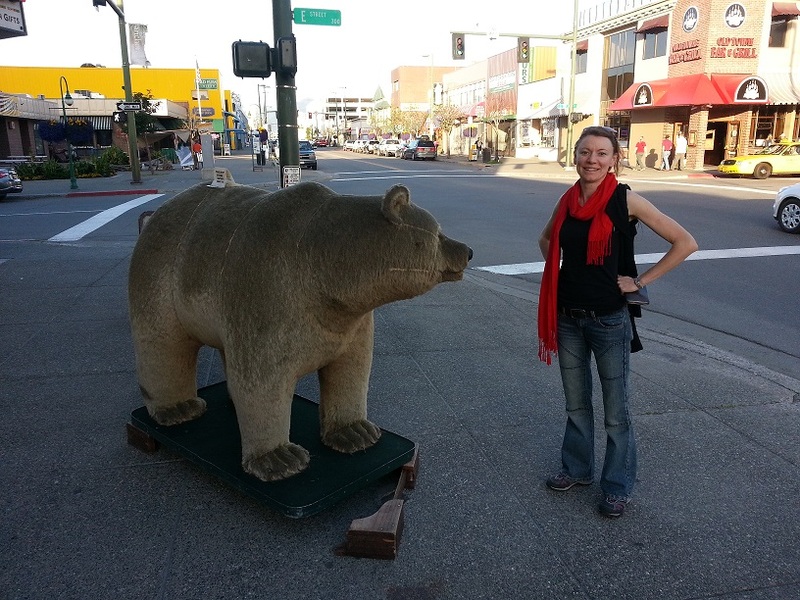 Loz with bear in Anchorage downtown… the closest I’m hoping to come to one!!! I cabbed it to the place where I was staying, thinking that Adrian would probably be there and hoping that the guy who owned the house would also be there to let me in. No luck on either front!! We had booked a room using airbnb – a website where people rent out rooms in their house – and although I’d confirmed with him just before leaving Sydney, I hadn’t received any instructions like, you know, how to get in. Fortunately, my first thought after the doorbell went unanswered was to check for a key under the mat and volia! So I got in – and went looking for a note or something telling me, you know, which room to stay in etc. No luck again! So I guessed which room looked like the spare/guest room and made myself comfortable. For a moment I did think it was a little strange that I’d let myself in to someone’s house using a key I’d found under their doormat, had helped myself to an apple from the fruit bowl and was now napping in one of their beds… but hey, it’s Alaska. Adrian finally arrived a couple of hours later and we went into town for dinner with Ben. Fresh vegetarian spring rolls and tofu and quinoa salad?!! Oh yes. I was so happy. Go Anchorage!!! If Alaska caters to my dietary preferences, surely I’m set for the rest of the trip? Who would have thought that between the fur, gun and bear/moose tourist shops we would be able to find such good food?! I think Adrian is a little concerned that my food expectations – which were very, very low – have now been inflated to unrealistic proportions. Anchorage itself is a cute little city. The population is about 300,000 and it seems pretty spread out. Every second shop in down town sells furs – clearly that’s a big thing here. And there are a heap of bars… according to my cabbie, Alaska has the biggest alcohol problem in all of the US.